Fine Art at Nepean Arts and Design Centre: Don’t wait until next year- Diploma of Visual Arts Now! Don’t wait until next year- Diploma of Visual Arts Now! 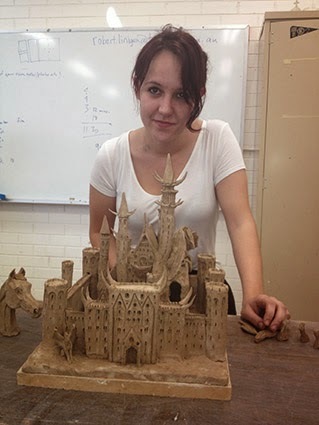 Jessica Roach Diploma of Visual arts graduate 2013. NADC will be starting a new group of students mid year in the Diploma of Visual Arts. You don’t need to wait until the beginning of 2015 to begin your course. Register online, then come to the information session on Monday 7 July at 12 noon in room PG35, Building P, at the Kingswood campus, Western Sydney Institute. Come to the session to find out more, see our great facilities, and you can show us art work you’ve made. We can advise you on whether the course will suit you. Your course would begin on Wed 16 July 2014. If you can’t make the session, call the section on 9208 9484 or Customer service on 131870. Teachers will be on holiday, so leave your contact number if you get the voicemail.